Manley Tyres and Exhausts is a family run business that opened our Birkenhead depot nearly 40 years ago. Since then, we have proudly delivered a quality service built on real care, expertise and honest support for our customers, ensuring they come back time and again. Check out our 5 star reviews here. We offer a wide range of products and services from tyres and exhausts to MOT Testing. As part of our continued commitment to our customers, we provide free MOT re-tests and free exhaust checks. We would be delighted to help you get your car or van safely back on the road, feel free to give us a call on 0151 647 9236 or pop in to our Birkenhead depot. Manley Tyres and Exhausts has been a family run business since it was established in 1981. As a family run business, we take pride in the care for our customers, building our success on word of mouth and referrals from loyal customers. We are a fully qualified MOT Testing centre for petrol & diesel cars, light vans and 4×4’s. We have almost 40 years experience fitting tyres and exhausts to all ranges of cars and light vans and we are members of the Business Approval Scheme. 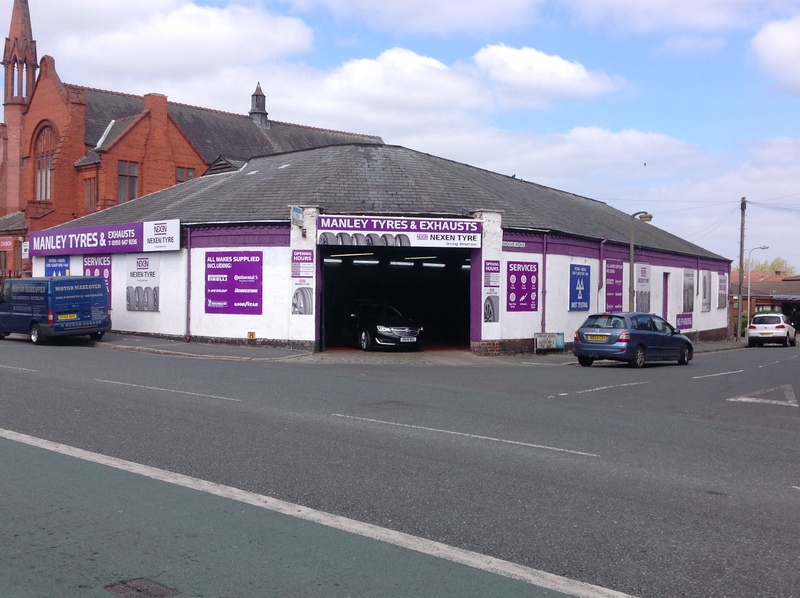 A stones throw from Birkenhead Town Centre, Manley Tyres & Exhausts is in a great location, with ample parking. The perfect place to drop your car off for an MOT test, tyres or to fix an exhaust, whilst you nip over to the shops. Our three core services at our Birkenhead depot are; MOT testing, tyre fitting and repair, and exhaust fitting and repair. Most tyres and exhausts can be fitted on the same day Monday to Friday if ordered before 11.30am or the following day if after that time. We have a wide selection of tyres and the expertise to guide in selecting the best tyre for your car, light van or 4×4. Our services include tyre replacement, run flat replacement, wheel balancing, tyre repairs and pressure sensor valve replacement/repair. An vehicle over three years old requires an annual MOT Test. We are a fully qualified MOT Testing centre that can test any petrol or diesel car, light van or 4×4. We offer FREE re-tests to anyone who fails their MOT at our MOT testing centre. With over 35 years of experience fitting exhausts, we are very well qualified to safely and securely repair or fit an exhaust on your vehicle. If you have a worry about your exhaust, come and see us, as we offer FREE checks on part or full systems. Have a question but can't get through on the phone? Send us a message here.